This is a guest post by Kelly Sponberg, community gardener at the Briggs Chaney garden in Montgomery County. Thanks for sharing your story, Kelly! I planted winter wheat in a section of my plots this past fall and recently harvested it all. I thought I’d share the experience and lessons. First, why wheat? Dunno. I like to experiment, and since wheat was so unlike vegetables, fruits, and even other grains I thought it was worth a go. I also like to cook, so being able to make a loaf of bread from scratch was a challenge to undertake (I’m still not quite there on this account). I also wanted something to plant over the winter that was more than a cover/green manure crop. Winter wheat is planted in the late fall (October, November), grows a few inches, and then dies back during winter. In spring it sprouts again, and then about mid-late June is ready to harvest. Had our spring this year not been relatively cool and wet, I might have harvested a week or two earlier. As it was I finished in late June. As for the bottom line (harvest yield), I used about 600 seeds, scatter sowed, over a roughly 300 square foot area. I used a red winter wheat that was supposedly a varietal used in Maryland many moons ago when wheat was grown here. In short it did well. I had a bit of fungal/soot issues, but it hasn’t affected the actual wheat berries, and I think it came at the very end of the season (again — wet spring). Pests were minimal, although that could have simply been because it was the first time wheat was grown in that plot — maybe even the garden. Oddly it did result in numerous wasp nests being built on the stalk. These seemed beneficial and didn’t bother me. After some reading I found my planting density was a bit light, and not using a hybrid or modern wheat, I probably had lower productivity than ‘normal’ or possible. I’ve removed all the heads, but I’ve not separated the wheat berries from husk (threshed and winnowed). Still, the heads weigh in total about 15 lbs. In my sample the wheat berries are about 80% of the weight of the head, so I’m looking at, after some waste, 10 pounds of flour. Not bad, although according to some sources, with row planting, planting at higher density, and using a modern wheat, I should be able to get 10 lbs per 100 square feet. In other words, with practice I should be able to triple the harvest. In perspective I grew flint corn in the same area last summer and only produced a 5 pound bag of flour; although I had drought issues then. What have I learned? Well, there are, as you might imagine, a whole host of different wheat varieties suitable for different kinds of flour. Winter and summer wheat apparently differ in protein content, so the all-purpose flour you get at the store is usually a mixture of different wheat types and harvests. 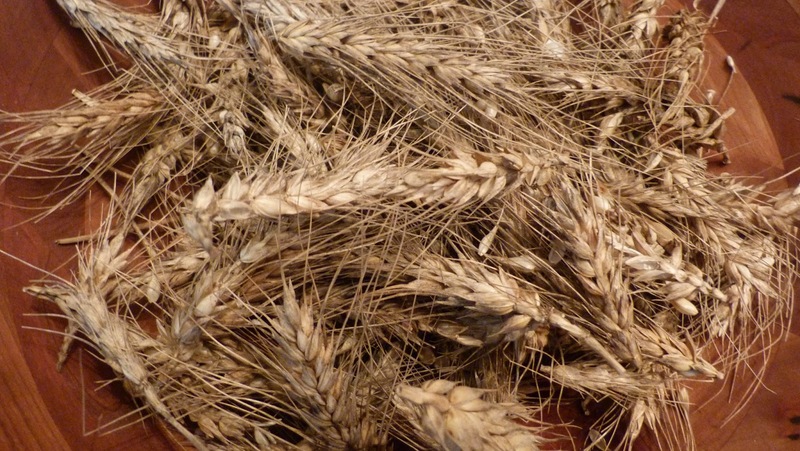 Wheat is also surprisingly easy to grow — at least on the garden scale. I only had to do minor weeding. Even at the industrial level wheat does not need a lot of fertilizer input. Everything I read said that unlike corn, wheat over does better in poorer soils than other grains. Most references advised against using any input (organic or otherwise) for small scale plantings, and irrigation is a no-no due to the fungus issues that plague wheat. For me at least, wheat was mostly a plant it and forget it situation. Having scatter sowed, I honestly spent 30 minutes planting the wheat, and then maybe another hour over a season weeding. I’m sure in future plantings it won’t be so easy as different diseases, pests, and/or temperature and water conditions will prevail. Most of the work, and there is a lot of it, came up at harvest and will continue with post-harvest processing. Harvesting is pretty straightforward, and aside from the wheat, you get a good bit of straw out of it — useful for other garden applications. But harvesting takes time, is a little messy, a killer if you have allergies, and can be deadly. I used a hand scythe and promptly filleted the skin off my finger, so I also learned how not to use a scythe. Between the emergency room bills and the cost for what I will have to build to thresh and winnow the wheat, this has not been a financially productive venture. My loaves of bread will be several dozen dollars each. But I got an education with each loaf. In all seriousness, the post-harvest processing is really the trick to wheat. It can be done by hand — beating, fanning, and then grinding — but that is extremely labor intensive and somewhat messy if you don’t have a part of a yard to accommodate processing. I have a new found appreciation for pre-WWI farmers and those farmers still un-mechanized in the developing parts of the globe. I am building a small threshing machine, and if you so choose to view them, there are a variety of small scale threshing efforts demonstrated on YouTube — these start at the slightly crazy and proceed to insane. Anyway, the machine I’m building will cost about $50 and take some elbow grease to build. So once again, not a cost effective crop the first time out. In short, growing wheat helps you gain a little perspective on global food systems, it is super easy to plant and grow a small scale, but it is a HUGE, HUGE pain to harvest and process — even if you don’t slice yourself. And yes, I do plan on trying wheat once again despite the finger and such. What a great project! I often grind a batch of various grains for additional nutrition in baking bread. (I found an old hand grinder at a second hand store.) I put in whatever grains I have: rice, millet, buckwheat, amaranth, barley. I cannot grind it as fine as flour, so I just use it in addition to the store-bought flour when making bread, but it makes good bread. Grew a small batch of barley once, but did not process it for consumption. I'd like to know how your home-grown wheat tastes when you finally get around to baking your bread.